← iPhone Killer: Is Google’s Nexus One The One? 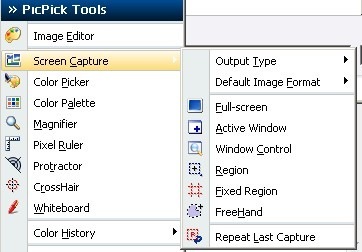 Make no mistake, I have been a big fan of FastStone Capture – the awesome screenshot capture tool that is available as both a free version (until a certain old version) and a paid version ($19.95). I have reviewed FastStone Capture here before and you can check it out there. 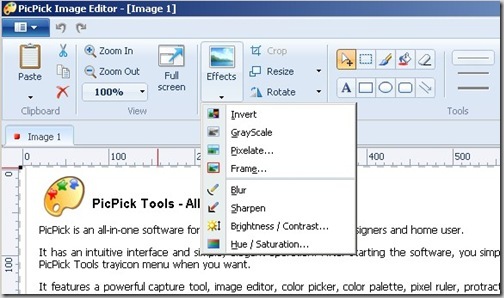 It is not just a full featured screenshot capture tool but includes a color picker, image editor, etc. I recently came across an alternative to FastStone Capture – PicPick Tools. PicPick is also a free all0in-one software for software developers , graphic designers and home users. Plus, here is my favorite feature. It requires no installation. It’s portable! The main functionality of this tool being screenshot capture, it really measures upto it’s promise by offering full screen capture with support for dual monitors, active window, scroll a page automatically, region, fixed region, freehand and repeat last capture modes. You could set a default image type or choose to send your screenshots to open with a default image editor of your choice or even upload via FTP or copy to your clipboard. 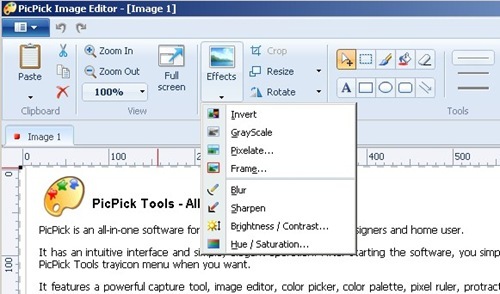 It also offers a decent image editor for basic editing of your screenshots but I prefer IrfanView for more robust editing features and Gimp for serious editing. I am going to have to revamp my top portable apps list with some of these new gems I have found recently. And PicPick is definitely earned it’s place there. I have been using Picpick for several months now with very good results. I would recommend it. There is a small problem with switching between dual and single monitors (dock and undock) for me in the most recent version.